A few months ago, I moved into my own place. I had to buy a step stool to reach things like the blinds and my cabinets, but other than that I’m fairly self-sufficient. I built a bed frame by myself when Ikea told me I’d need at least two people to get the job done. I fixed the hinge on the door to the laundry. I’ve killed bugs that in the past would have made me cry out of pure fear. Okay, I might still cry. But I kill them by myself anyways. Push through the tears. Also, I have a lawn. Which is pretty exciting after living in the city for nearly a decade. The only problem is that I have to mow it. That’s not really a problem in and of itself. When I was growing up, I had to mow our nearly-an-acre, hilly plot. I would load up my walkman with my favorite Rx Bandits CD and got the job done. But to relive the days of my youth, I had to first get a lawnmower. Getting and storing gasoline in a container freaks me out, and I’m trying to save the planet. So gas mowers were out. I looked at electric ones, but they were too expensive. Then, my friend recommended this gem. It’s a great push mower. But I wouldn’t have told you that the first time I tried to mow my lawn. It was super hot out. My neighbor had been doing my side of the lawn for me for a couple weeks while I tried to get the mower situation figured out. So I needed to pay it back and mow his. There were innumerable sticks in the yard. Those could be removed, but there were also tree roots, which couldn’t be. There was a massive hill on his side, which was no fun to take care of. And because I had taken so long to get this done, the grass was super thick. After about an hour of exerting more energy than anyone would ever want to, I went inside to get a drink or five of water. While I was in there, I heard a gas engine rev up. My neighbor was remowing the lawn. That’s how terrible of a job I had done. Taking pity on me, he also did the part I hadn’t started yet. I was pretty discouraged, and gave up on my frugality. I set up services with multiple landscapers, all of whom flaked out on me. My neighbor moved out, and I had to figure out what the heck I was going to do. The other day, I tried it again. I got out the push mower I had given up on. I set out to do my half of the lawn. And you know what? Yes, I sweat, but that wasn’t something I had been afraid of. I don’t really know why it was so much easier this time. Maybe the grass was shorter. Maybe it wasn’t as humid out. Maybe I had gotten stronger Maybe my side of the lawn has less tree roots than his did. Regardless, I’m glad I tried again. I’m glad I proved to myself I could take care of my own self. And I’m super glad I was able to do it without using gasoline, without paying someone else to do it for me, and without spending money on a more powerful electric lawn mower. If at first you don’t succeed, try again. You might still be able to save money. And assert that you are the one with the power–you don’t need a machine or any other human being to exert that power for you. This entry was posted in Think, Ways to Save Money on July 23, 2018 by femmefrugality. The reel mower! Mr. Money Mustache would be proud. I’ve never used one, but I’ve heard that sharp blades are the secret. Congratulations on the new place!!! Would I know the part of town? We had one of those growing up. I’ve heard that they tend to do I better job at cutting the grass than a gas or electric mower. Something to do with how it cuts differently. Interesting! I know it didn’t have the umph for maneuvering those tree roots the first time around, but a weed whacker might be required for that portion either way. I have no idea what I’m talking about. This is the first time I’ve mowed a lawn as a grownup. I remember my family having one of these! GO YOU! Those things are great but they are a workout for sure. Dang! Even pushing our gas mower around is a workout, I cannot imagine what it takes to move a push mower 🙂 You go!!! I used to “help” my dad mow the lawn with one of those! 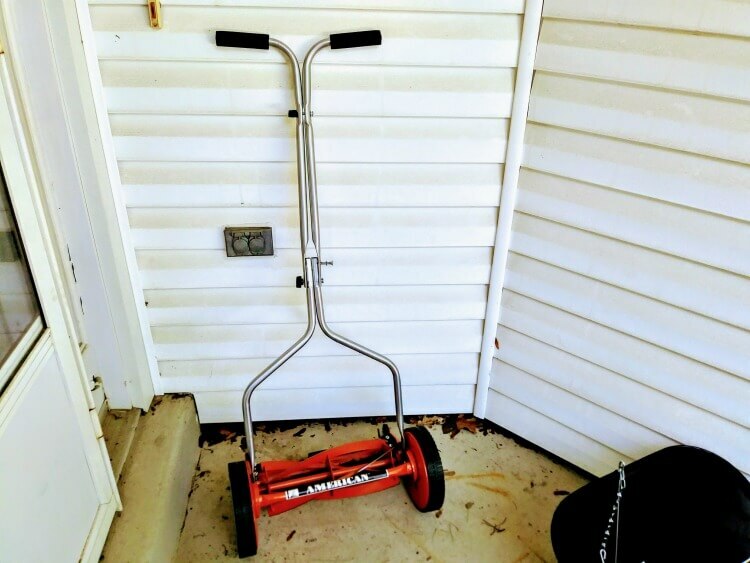 I have never once used the gas mower my husband insisted on getting. It’s a scary thing! Well done! A little sweat is a good thing. So is a lot of sweat. And I bet your 2nd try was easier because your neighbour had moved and you were feeling less obligation/stress about doing it all perfectly. Does that sound about right? I’ve also heard that you need to keep the blades sharp. A gas mower needs its blades sharpened, but the power of the motor can still compensate for dullness, whereas the push mower doesn’t have that power to compensate.